On December 7, Mexico’s President Enrique Peña Nieto unexpectedly announced he was signing a series of decrees which included the establishment of the Pacific Islands Biosphere Reserve off the west coast of the Baja California Peninsula in the Pacific Ocean. The new 2.7 million acre reserve includes 21 islands plus 97 islets and the surrounding marine areas which serve as a habitat for marine mammals and seabirds, as well as commercially important fish and shellfish. The creation of the Pacific Islands Biosphere Reserve caught many off guard, resulting in a flood of inquiries regarding the impact on recreational and sportfishing anglers who feared the worst. Many of their questions concerned the impact on access for their fleets to the protected areas. 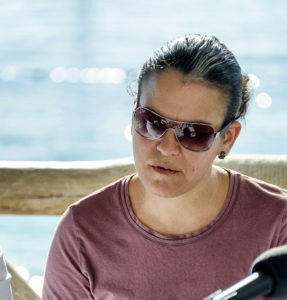 After an 11-year, multi-stakeholder consultation and a painstaking negotiation process, this newly created reserve represents a major effort to protect Mexico’s islands and much of the surrounding waters where marine mammals and seabirds live and reproduce, plus the fishing grounds upon which the livelihoods of local cooperatives depend. The announcement was quickly published in a 100-plus page document the size of a coffee table book that reflected the enormity of the undertaking, complete with maps of the areas included in the decree. 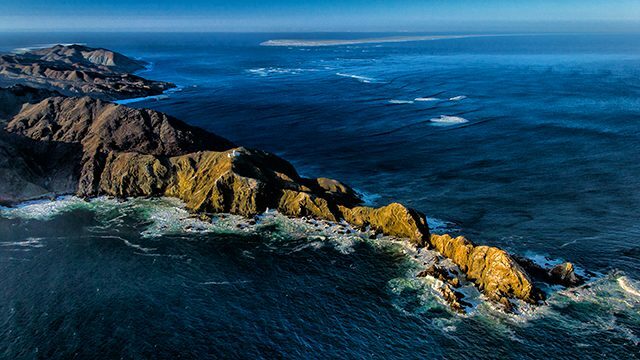 Mexico’s new Natural Protected Area (NPA) not only includes the 21 islands and the 97 islets, but also the surrounding ocean waters in eight areas, including Coronado, San Martin, Todos Santos, Cedros, and Benitos Islands, Isla San Martin, Isla Jerõnimo, Isla Adelaida, Islas de Magdalena Bay and Alijos Rocks. Along with an overview and generalized outline of intent, the document offers a broad outline of rules and regulations to be fine-tuned during a series of meetings in the next few months. Locations of the meetings are yet to be announced. Attendees, who will be part of the discussion during the meetings, will include user groups, Mexican navy, local fisheries officials, Ken Franke, President of the Sportfishing Association of California (SAC), accompanied by his staff, along with interested fishermen. “Now that the Pacific Islands Biosphere has been created in title, the Mexican Government is working on the management plan for the islands. We hope that the transition will be smooth with no interruption of coastal marine recreation, and we look forward to participating with CONANP during the process, as U.S. vessels will be customers of the Biosphere,” explained Franke. She closed stressing the importance of not jumping to any conclusions until all the details were determined. Meanwhile, there is no impact on the areas included until all of the details have been finalized. 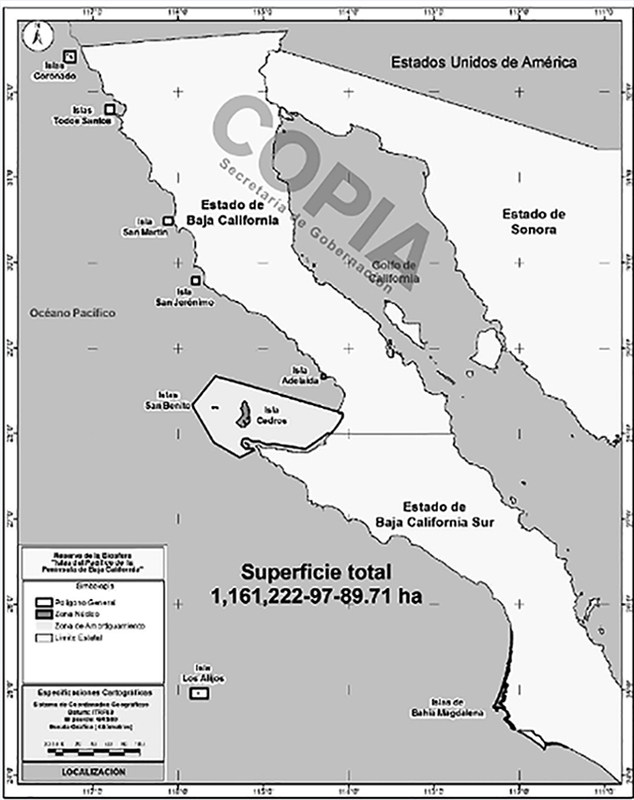 https://www.bdoutdoors.com/sac-baja-mexico-efforts-yield-positive-results/ (Navarro’s Pacific Islands Biosphere Reserve comments are in the second hour). The highlights from the document (published in Spanish) noted the deep-sea Pacific Islands Biosphere Reserve will be the country’s largest NPA which includes the water column below 800-meters and fragile seabed ecosystems. Its distinctly conservation tone indicates the purpose of the reserve. Mining and fishing will be allowed, but forbidding the use of trawling gear (purse seiners and shrimp trawlers) and other destructive industry outside the strictly protected core zones, consistent with UN General Assembly resolutions, is a positive for the recreational angling interests. Sportfishing is a recognized activity within all the area included in the new Pacific Islands Biosphere Reserve. However, the specifics regarding bag limits, access, fishing methods, designated seasons and areas for fishing will be established before finalization. Preliminary discussions hint toward a similar program to the wrist band method being used in The Bay of Loreto National Park. 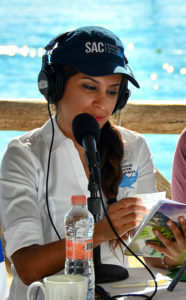 However, there would also be a passport to be purchased annually allowing access to the biosphere areas similar to the ones currently available online which would work for most areas including the Coronados, Todos Santos and San Martin Islands, Isla San Martin, Isla Jerõnimo, Isla Adelaida and Alijos Rocks. Cedros and Benitos might be off-limits to sportfishers unless they somehow partner up with local island businesses. Part of the biosphere’s protection is not just about birds, plants and fish, but it also protects the interests of current businesses on the islands. Cedros now has a thriving panga fleet, with three operations that fly anglers in from the U.S. and Ensenada. To recap: The Coronado Islands, Todos Santos Island, San Martin Island, Isla Jerõnimo, Isla Adelaida, Islas de Bahia Magdalena and Alijos Rocks should continue to be accessible with some minor restrictions likely that will be resolved at the aforementioned meetings. 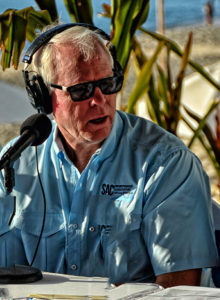 At Cedros and Benitos Islands locals must reach a satisfactory agreement within the guidelines with the sportfishing community to adhere with the directives set forth. In conclusion, Mexico’s vast ocean resources have been diminished by commercial fishing for decades. Having the highest level of government recognize that fact and include restrictions to forbid the use of trawlers and seiners in the area is certainly a step in the right direction. Although this is a positive beginning, it might lead to methods like inshore and offshore gillnetters being banned. However, I’m not suggesting apathy, no, just the opposite. 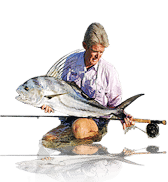 Support our sportfishing recreational angling representatives. Attend meetings and let your opinions be known. The basics of the biosphere document were translated by Jose Sanchez of Cedros Outdoor Adventures, a marine biologist, and his partner in the business, his wife Melanie Lamaga, and posted on their website. With their permission we are posting a condensed overview of the decree. – In Mexico, Natural Protected Areas (NPAs), also known as Biosphere Reserves, are created by the Federal Government and signed into law by the President of Mexico. – NPAs have the main objective of the preservation and sustainable management of the natural resources, ecosystems and species of wildlife in the area. 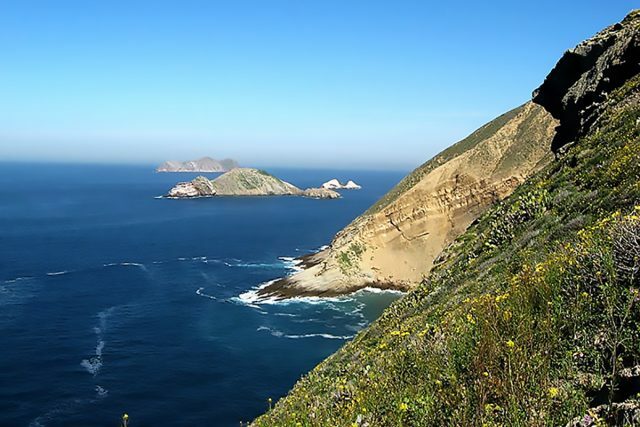 –The new NPA (Islas de Pacifica de Baja California) includes Cedros Island, plus 20 other islands and 97 islets, along with the surrounding waters. – On these islands and the surrounding waters, unique ecosystems and species exist. Some are rare, endangered, or require strict management with focus on sustainability. – As in every other Mexican Biosphere Reserve, as specified by the law, the main beneficiaries from the use and exploitation of these natural resources are the local communities, who must be involved in any economic activity (as was done, for example, with whale watching in San Ignacio lagoon). 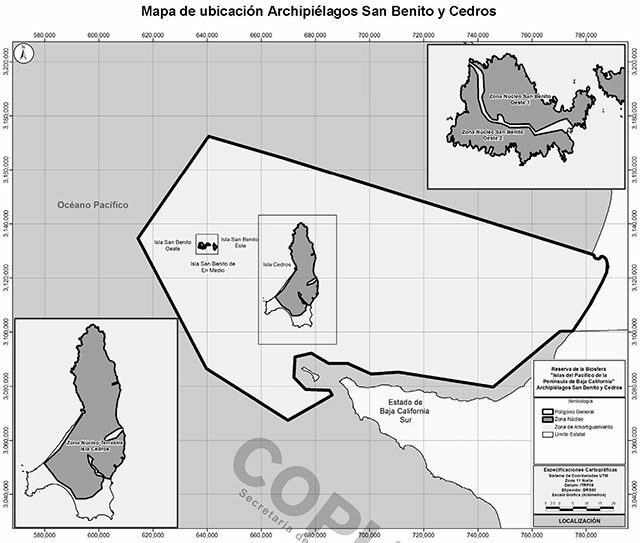 – In the case of Benitos and Cedros islands, the local community and local sportfishing operations in existence before the decree will be the exclusive ones allowed to develop projects to exploit the fisheries and resources of the area going forward. – The Pacific Islands Biosphere Reserve decree establishes the general rules, effective immediately after its publication (Dec. 7, 2016), but the specific details of its operation and management will be decided during the various meetings and discussions coming over the next few months. The resulting bylaws will be used by the agency of the NPA (CONANP) to administer the NPA. – Any concession or permit issued before the decree will be valid until its expiration. – In the Pacific Islands Biosphere Reserve decree (read here) there are maps in which areas are illustrated, noting the areas off limits for certain activities or access (i.e., Zonas Nucleo and Zonas de Amortiguamiento). – Destructive and intensive fisheries such as shrimp trawlers and seiners are banned from working in all of these areas. – In the Zonas Nucleo (all are on land) permitted activities include conservation, restoration, research, education, low impact tourism, among others. – In the Zonas Nucleo it is illegal to pollute, to hunt (except for eradication of exotic species), mine, etc. 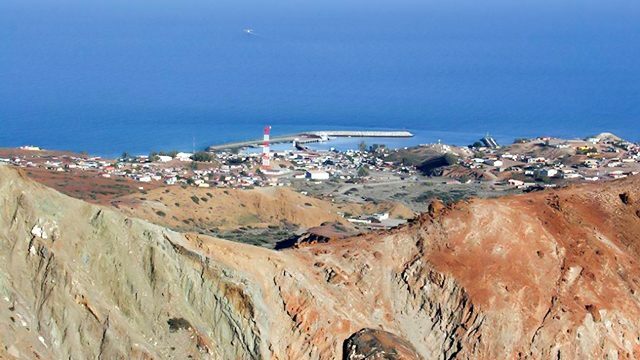 – In the Zonas de Amortiguamiento (marine and land) permitted activities include all of the ones of the Zona Nucleo and use of natural resources for locals subsistence, fishing (within regulations), infrastructure for navy, research, and safety, and navigation (use of ports), aquaculture. In the case of Cedros and Benitos area, fishing vessels cannot exceed 10.5m in length. – In the Zonas de Amortiguamiento and in the Zonas Nucleo the following activities are illegal: to build containments for dangerous substances; to build disposal sites (except for Cedros and Magdalena); spear fishing; fishing trawling or using permanent structures; using chemicals for fishing; to affect ecosystems in any way; to bring exotic species to the islands or use for aquaculture; to build any private infrastructure outside of the population centers; to start fires or create loud noises that disturb the wildlife; to make major repairs or maintenance to boats and motors; to use explosives. – Users of the areas are obligated to respect the conservation mandate within the specific regulations and permissions, for sustainability. For these, an EIA should be submitted and must comply with the management program.